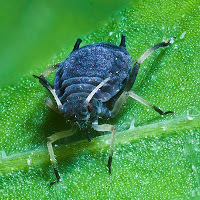 Home Pest control	Dealing with aphids, killing aphids, organic aphid control and an aphid spray recipe! I often get asked questions about aphids. Since I just noticed one of my citrus trees was covered in aphids, I figured why not cover the basics on aphids and aphid control in a video? I got a new Nikon Coolpix L830 camera on Amazon last week so I’m going to be making a lot more gardening videos. It’s HD, plus takes great still shots for a non-SLR. My previous video camera was the Nikon Coolpix 105 which also was my workhorse still camera for the first two years of this blog before we bought a friend’s used Canon Rebel for the still shots. That does a great job even though it’s an older model. 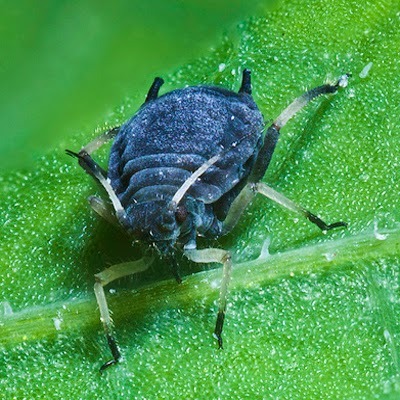 Okay – back to aphids. Gather together your garlic cloves and hot peppers. I like really hot ones such as cayenne, Thai, ghost or habanero peppers. Chop them up with the garlic and put them in a quart jar. Then pour a quart of boiling water over them. Let steep overnight, then strain the liquid through a coffee filter into a spray bottle. Add two drops of dish soap to the mixture and shake it up. The aphids hate the taste, the soap, the hot peppers and the garlic so they usually clear out quickly. Alternately, you can make a nicotine aphid spray with the simple recipe in my video. If you don’t have cigar butts available (you poor non-smoker you), just buy a packet of Topp or Bugler rolling tobacco and use that. Generally, though… I ignore aphids and if they really bug me I blast them with the hose. I’m always cognizant of the fact that I may kill or drive off good ladybugs or other predators with my spraying. Unless it’s a matter of life and death for the plant, I’m lax. I will be posting a lot more videos in the future – keep watching and be sure to subscribe to my YouTube channel. Thank you David for this info on aphids. I thought this is what I had on my Miracle fruit, but I now believe it is actually scale. I sprayed the trunk of the tree and container with diatomaceous earth and it stopped the ants so I hope it stops the scale I did have aphids on my Roselle plant last year and with the ants I ended up pulling the whole plant out and throwing away. There were too many bugs on the calyxes for me to keep up with. I appreciate your real world experience you share as I live south of you in Naples and the conditions aren't too terribly different. Diatomaceous earth works great on a lot of insects… we use it to nail fire ants on the back porch. Too bad about the roselle – that's frustrating.